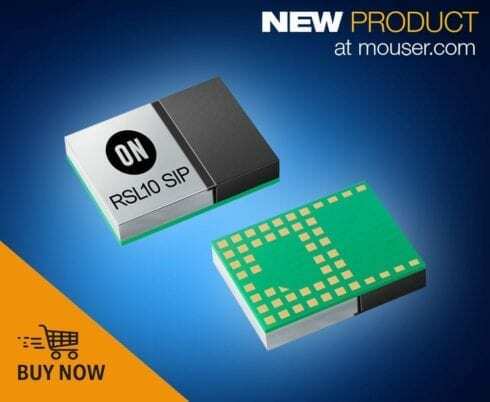 Mouser Electronics, Inc., the authorized global distributor with the newest semiconductors and electronic components, is now stocking the RSL10 multi-protocol system-in-package (SiP) from ON Semiconductor. With ultra-low-power wireless connectivity to meet the needs of a broad range of connected applications, the versatile Bluetooth® 5-certified SiP includes support for a 2 Mbit per second (Mbps) RF link as well as 2.4 GHz proprietary or custom protocols. The ON Semiconductor RSL10 SiP, available from Mouser Electronics, features a 48 MHz Arm® Cortex®-M3 processor bolstered by a 32-bit dual-Harvard DSP core that supports intensive signal processing applications. Including both flash and RAM, the device’s diverse memory architecture enables storage of the Bluetooth stack, as well as other applications. The highly integrated RSL10 SiP includes a DMA controller, oscillators, and high-efficiency power management units, and supports a supply voltage range of 1.1 to 3.3 V.
ON Semiconductor is a premier supplier of high-performance, energy-efficient silicon solutions for green electronics. ON Semiconductor’s broad portfolio of power and signal management, logic, discrete and custom devices helps customers efficiently solve their design challenges in automotive, communications, computing, consumer, industrial, LED lighting, medical, military/aerospace and power applications.